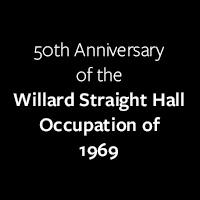 Frank Dawson ’72, who as a first-year student participated in the occupation of Willard Straight Hall, will hold a public conversation with Harry Edwards Ph.D. ’73. At the time of the occupation, Edwards was a sociology Ph.D. student and Woodrow Wilson Scholar who fully supported the occupation and played a prominent role in the Barton Hall teach-in that followed. As a civic activist, Harry Edwards organized and rallied support for a proposed boycott of the 1968 Summer Olympics in Mexico City. That action led to the iconic gloved hand protest by medalists Tommy Smith and John Carlos, as well as other symbolic gestures by Olympians. Edwards is Professor Emeritus of Sociology at the University of California-Berkeley and one of the preeminent observers and scholars on the experience of black athletes, as well as a consultant on issues of diversity for the National Football League, Major League Baseball and the National Basketball Association. Edwards has consulted on numerous sports-related TV and film productions in the U.S. and abroad. He has received dozens of awards and honors, including several honorary doctorate degrees, and authored dozens of articles and four books: The Struggle That Must Be, Sociology of Sports, Black Students, and The Revolt of the Black Athlete. Admission is free and open to the public, no ticket required.